Sometimes, the best way for a child to learn is through play! Children learn in a multitude of ways. Sometimes, the best way for a child to learn is through play! Many people do not realize that playing with certain toys can be extremely beneficial to a child’s development. It can help your child become a problem solver, and develop the necessary social and motor skills they need to succeed as they grow older. Here are some of the ways a child can learn through play and how it can play an important role in their development. There are two types of motor skills: fine and gross. Gross motor skills refer to the large movements a child makes with their arms, legs, and feet. This refers to any movement that requires their entire body such as walking and crawling. These movements are natural, and a child usually can figure out on their own. 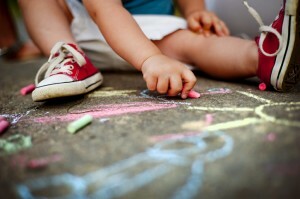 Fine motor skills, on the other hand, take much longer for a child to develop. They are acquired through the use of small hand toys, sports, and various forms of physical activity. One of the best ways for a child to develop social skills is for them to play with other children their age. If your child is on the shy side, try to schedule play dates with other parents. It is amazing how quickly young children can make friends. Another option is to sign them up for a recreational sports teams or clubs. You want to get your child interacting with many different people because that is going to help them develop important social skills. A child develops cognitive abilities through play. Children are naturally curious. For example, many children love assembling legos and putting puzzles pieces together. There are all sorts of fun toys that can make your child a better problem solver. This entry was posted on Friday, March 9th, 2018	at 9:53 am	. You can follow any responses to this entry through the RSS 2.0 feed. Both comments and pings are currently closed.